The National Review Years, March 7, 1980 — If there were a Thomas Aquinas among us, his talents would be needed to supply irrefutable proofs of the Soviet Union’s existence. A great many people seem unable to believe it’s really there. The unbelievers, in fact, tend to dominate the mass media — or did, before Afghanistan. A man who had spent the last decade glued to his TV set would never have supposed the Soviets were engaged in an enormous military build-up, still less that any use would be found for all those weapons. The preferred enemy is always to the right. Long after it had ceased to be possible to idealize the Soviets, it remained impossible to have a Soviet villain in a movie or TV show. But the media need drama, which means conflict, which means villains. In the selection of villains the operative principle has been James Burnham’s Iron Law of the liberal sensibility: the preferred enemy is always to the right. Long after it had ceased to be possible to idealize the Soviets, it remained impossible to have a Soviet villain in a movie or TV show. So we have had a spate of Nazis (and neo-Nazis), multi-national corporations, mean Southern sheriffs, and other subjects of editorial deplorings. If I Led Three Lives were a TV series today, Herb Philbrick would have to be depicted as a threat to civil liberties. One doesn’t have to be particularly of the Right to sense that something is missing. The idea that Nazis holing up in the Amazon jungle could still pose a threat to anyone suggests an obsession that overwhelms all sense of actuarial reality, but you’re more likely to see a film based on that assumption than on the obvious fact that, say, the KGB kills people. Today’s bold prophets — the real ones — are the people the Western media ignore. They are the Christians behind the Iron Curtain, and the Free World Christians who smuggle Bibles to them. It’s one thing to celebrate the Allied victory over the Nazis and Fascists. It’s something else to suggest that the immediate peril is from octogenarians who have made a breakthrough in genetic engineering, as in The Boys From Brazil. Imagine a movie about Sioux Indians preparing to scalp the citizens of Bismarck, North Dakota, in 1980. On a recent Sunday morning I happened to be watching the Catholic program Insight, which I had never seen before. Sponsored by the Paulist Fathers, it raised the question, How would Christ be treated if he came back today? It tried to answer this question with a parable. The persecution of Christ does go on today, and if we’re talking about either scale or intensity we have to look first at the Communist world. In what appeared to be a Latin-American country, a group of street clowns tries to amuse and edify the people. Their leader is named Bobo (Martin Sheen). Just then, a new regime takes over and starts arresting people, including the clown troupe. What for? For suspicion of subversion. The generalissimo orders Bobo brought to him. He explains his position — that the nation needs law and order, and protection from the Marxists — while offering Bobo a share in the rich repast his servants are bringing in, and promising more benefits if the clowns co-operate with the new order. Bobo, who until then has seemed as frivolous as Mork from Ork, suddenly reveals himself as a shrewd liberal (if you can accept the concept). He bats down the generalissimo’s excuses for tyranny, pointing out that the nation’s wealth belongs to the people — an unprecedented idea that causes His Excellency almost to swallow his cigar. No compromise is possible. James Hitchcock has identified … the Dirty Little Secret of liberal Catholics: the perduring Communist war on religion. Bobo is taken out to face a firing squad. He keeps clowning merrily to the end, confounding his thuggish captors. From their prison cell, the other clowns watch him die, and sing a song of ultimate triumph, in which they are joined by an American tourist in the cell, whose consciousness has been raised by his own false arrest. Clearly the new fascist regime is doomed. Get it? Bobo is Christ. There is no point in belaboring a minor and sappy piece of work for a vice it shares with so many other things. But the persecution of Christ does go on today, and if we’re talking about either scale or intensity we have to look first at the Communist world. If anyone should be singled out for ignoring what nearly everyone ignores, it should be Christians who affect to enlighten us while concealing what James Hitchcock has identified as the Dirty Little Secret of liberal Catholics: the perduring Communist war on religion. Sergei Kourdakov used to kill Christians; then, revolted by his life, he fled the Soviet Union and became a Christian himself, trying to warn the West against the evils he had helped perpetrate. One needn’t be a cold-warrior to notice this. It’s perfectly possible to be a pacifist or an isolationist or even a common liberal, and to think all military conflict with the Soviet Union should be avoided, while taking note of the actuality of Communist life — not blueprint “Marxism,” but Communism as she is lived. In fact, people who stand morally neutral between the two super-powers, without patriotic or strategic commitments, are in the best position to make the purely humanitarian case against Communism. Why are they afraid to? The media are saturated with trendiness, and in a way this includes even those cheap, pitiful little Sunday morning productions in which some religious order tries to prove its relevance by simulating prime-time metaphysics. Today’s bold prophets — the real ones — are the people the Western media ignore. They are the Christians behind the Iron Curtain, and the Free World Christians who smuggle Bibles to them. 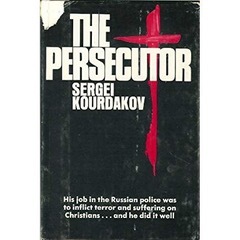 You won’t see these people on television, but you can get a most moving glimpse of them in a little book called The Persecutor, by Sergei Kourdakov (published by the Fleming H. Revell Company, in Old Tappan, N.J.; $1.95). Kourdakov used to kill Christians; then, revolted by his life, he fled the Soviet Union and became a Christian himself, trying to warn the West against the evils he had helped perpetrate. He was only 21 years old when despair or the KGB caught up with him, just outside Los Angeles, in 1973. Copyright © 2018 by the Fitzgerald Griffin Foundation. All rights reserved. 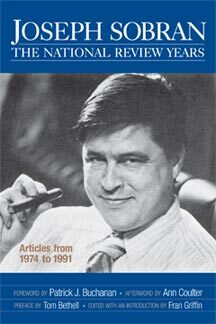 “Unbelievers” by Joe Sobran was published originally in National Review magazine on March 7, 1980. This is one of 34 articles in the Sobran anthology, Joseph Sobran: The National Review Years published by FGF Books in 2012. The book is currently out-of-stock, but the Fitzgerald Griffin Foundation hopes to reprint soon. Joe Sobran (1946-2010) was an author, political commentator, and syndicated columnist for over 35 years. Sign-Up to receive weekly columns by Sobran and other writers.